I like to travel within New York City, to explore the far away neighborhoods, and the not so faraway. There are so many ridiculously good things to eat here, we really are very lucky. 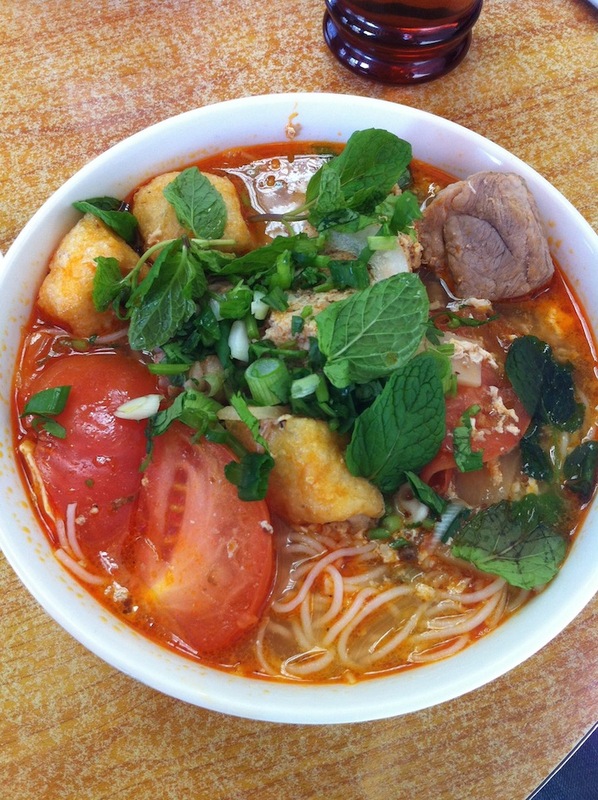 Just look at this bowl of Bun Rieu, the Vietnamese crab paste soup with vermicelli noodles that I recently ate in Sunset Park, Brooklyn. 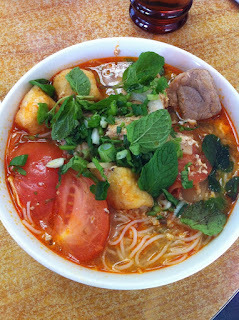 At Thanh Da, this soup is served with fried tofu, chunks of pork rib, tomatoes, and lots of mint. Pure savory satisfaction. Not too long ago a good friend and I went on walkabout to explore the Forest Hills Gardens section of Queens. This is a neighborhood designed by Frederick Law Olmstead's son, and its streets are privately owned. They have their own garbage collection and security services, if I'm not mistaken. Anyway, I couldn't help but point out to my pal that Rego Park was within walking distance, and its incredible Bukharian restaurants. 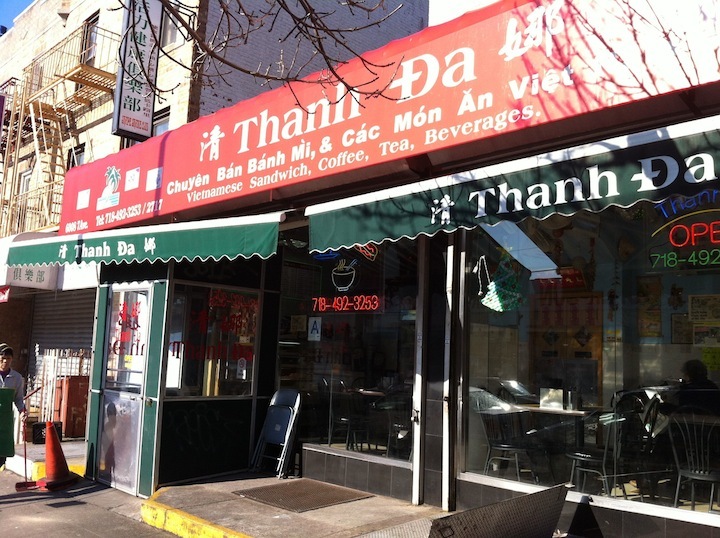 We ate a memorable and very large meal at Restaurant Salute (108th street and 63rd Road). This is a kosher restaurant owned by Uzbek Jews. 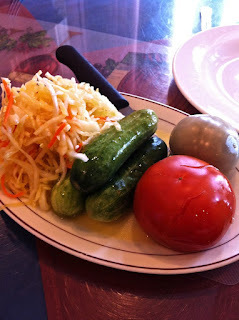 We began with a gorgeous plate of expertly made pickles, and two kinds of dumplings. 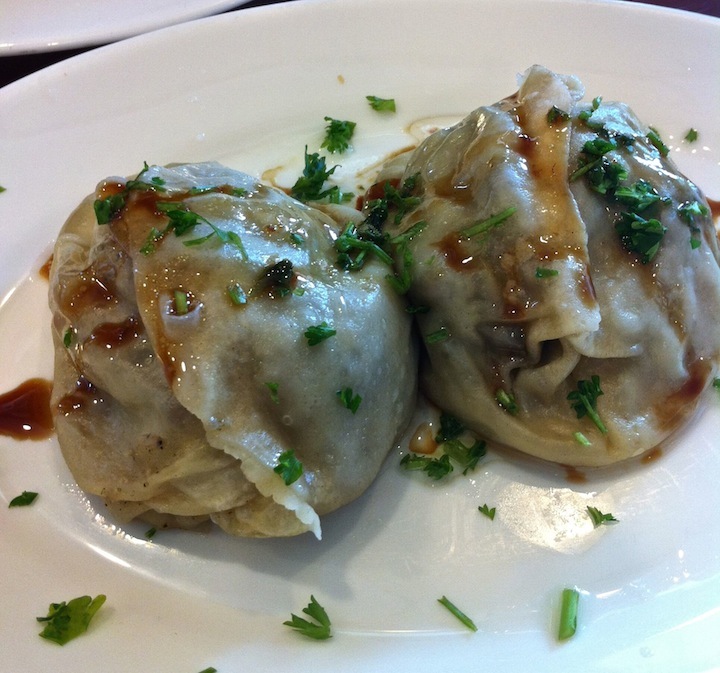 These are Uzbek dumplings called manti, filled with ground meat (lamb?) and spices. I love them at Salute. If they remind you of certain Chinese dumplings, that's because there was a lot of mixing of food and technique as people traveled along the silk road a long time ago. 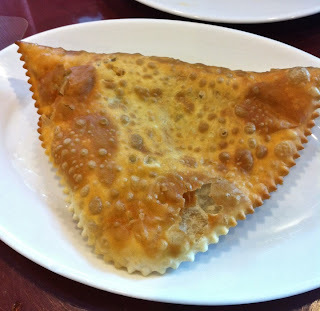 On the Salute menu these are called "Juicy Crimean Dumplings," and I think the real name for them is Cheburek. They were delicately spiced with cumin, and were indeed very juicy and delicious. 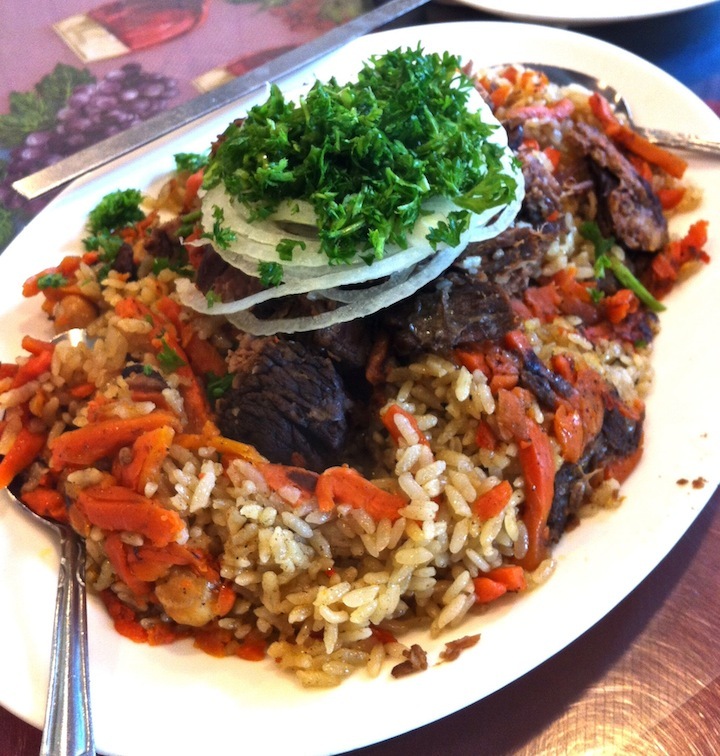 We ate pilaf, rich with chunks of lamb, carrots, and cooked onions. Not a powerfully flavored dish, but savory and very comforting. 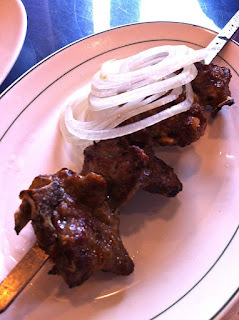 And we ate kabobs, of course, a skewer of lamb ribs and another of ground lamb and beef spiced with cumin. Both were expertly grilled and a with a little bit of the "sauce for meat," made of plums, dill, onions, chilis...wow, that's just good stuff. 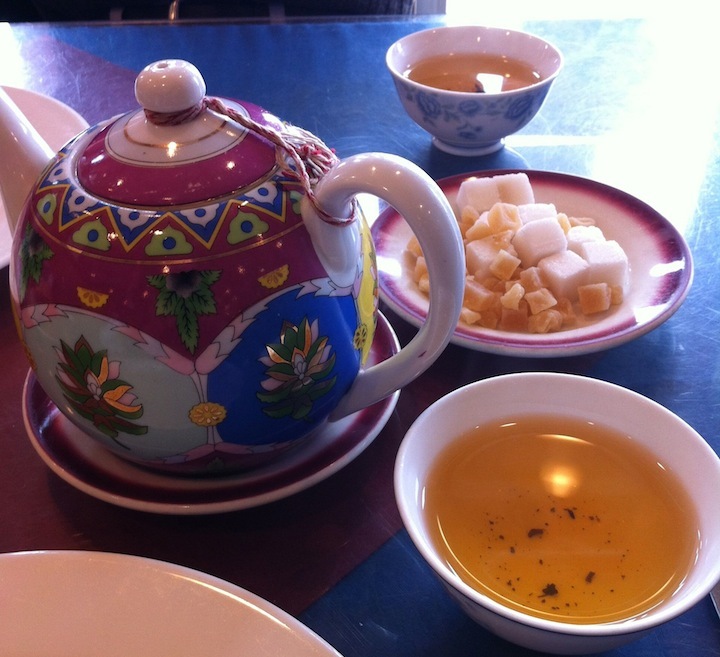 I love to have a pot of green tea at Salute. Beautiful colors, delicious tea, and another reminder of how complicated the mingling of food and culture is all over the world. Get ready for this last bit because if you live in New York, you're going to freak out a little. I was in Chicago recently and a colleague who lives there took me to a place for dinner in his neighborhood, called Humboldt Park. He had no idea that I'm into wine, he just likes this place called Rootstock. Whoa - what a find! This place simply couldn't exist in New York. There would be twice as many tables squeezed into the same space, and everything would need to be at least twice as expensive. The food was delicious. 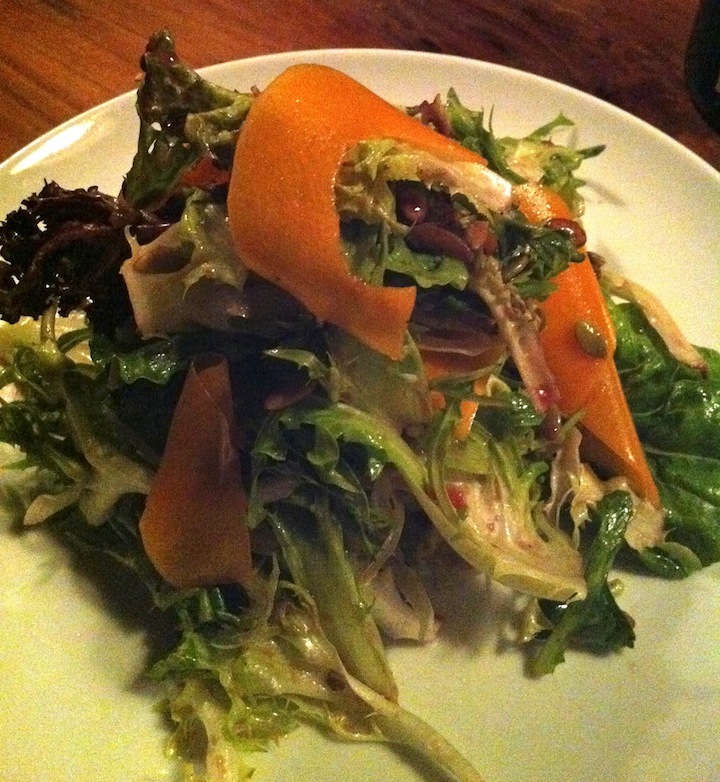 A salad topped with pickled squash and sunflower seeds ($8) was refreshing and bright. I guess Portland and NYC are not the only places where anything can be pickled. Chicken liver mousse with pickled cranberries and pink peppercorns ($6.50 !) was truly excellent, although served with rather uninspiring bread. But the mousse was so good that it almost doesn't matter. 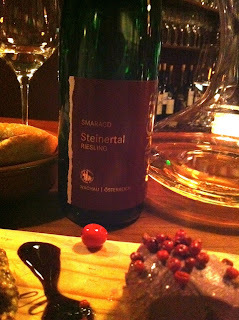 And that bottle you see there...it is the 2009 Alzinger Riesling Steinertal, and it cost all of $60 on the wine list!! This is a wine that typically costs more than that at a retail shoppe in NYC, if you can find it. The wine list was excellent, really really great. 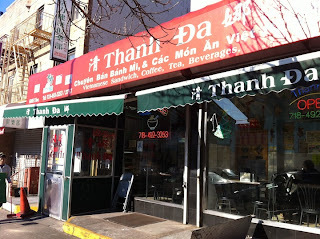 There were so many things that I wanted to drink, and the prices were great, from my NYC viewpoint. This is a place that serves Bernard Baudry Chinon Blanc by the glass. There are loads of interesting beers to try, the shelves were stocked with great spirits, and to top it off this place serves Sherry by the glass too - Gutierrez Colosía's lovely Oloroso called Sangre y Trabajadero, and El Maestro Sierra's Amontillado. I mean really, folks, this place is a gem and I would go back 10 times. 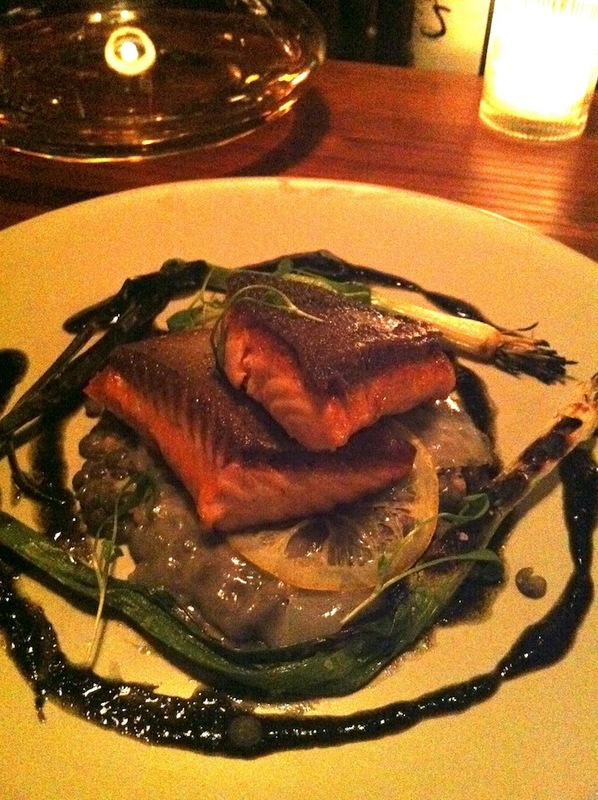 And by the way, the Steelhead Trout with lentils and grilled scallions ($13 !! )...not bad with Steinertal, not bad at all. Yes, it's probably 15 years too soon to get the most out of this wine, but a good decant and two hours in, this was singing a lovely tune. Old or Young Wines First? The other night I had dinner with 7 other people in Manhattan, a dinner featuring 12 vintages of Marcarini Barolo Brunate. Three wines each from the 60's, 70's, 80's, two wines from the 90's, and the 2007. I had never before had such a broad array of Barolo vintages in one night. It was amazing to experience the evolution of such finely pedigreed Nebbiolo, to feel the changes as it gets older. We drank the oldest wines first, and ended with the 1990, the 1996, and the 2007. We began with the flight from the 60's - the 1964, 1967, and 1969. There was some discussion at the table - is this the right way to do it? Some felt that we should have started with the young wines. I appreciated drinking the oldest wines first, in that I was as sharp as a taster as I would be that evening, and perhaps best able to appreciate the fine subtlety of the grand old wines. Or maybe I should say, the young wine tannins hadn't yet affected my mouth. That said, when we got to the 80's flight (1982, 1985, and 1989), the wines seemed very young, nowhere near as thrilling as their older cousins. Perhaps a great 1982 served after a great 1964 just cannot shine as brightly as it would on its own. This is not the first time I've gone oldest to youngest in the past few months. 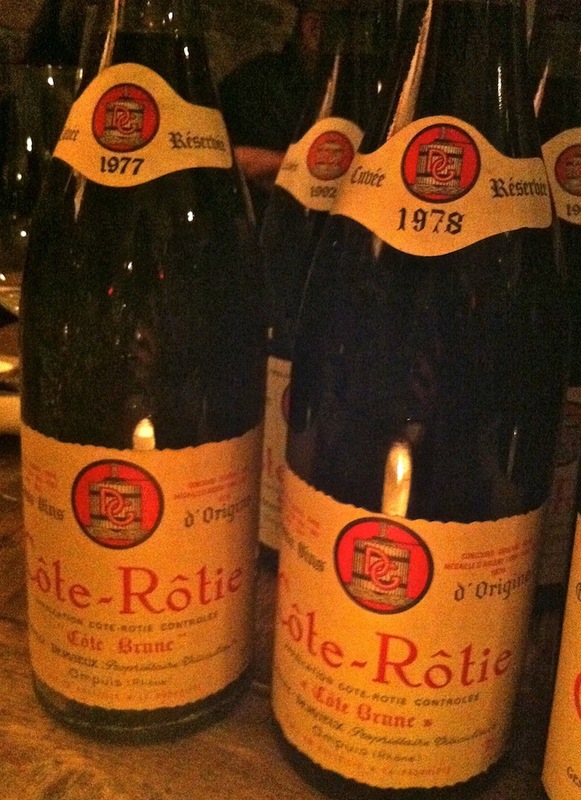 Not long ago at a Noel Verset dinner, we began with the older wines. I'm not sure how I feel about this yet (although clearly I would drink these wines in any order and enjoy them). 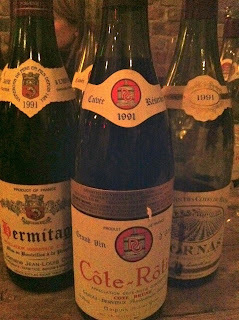 And at my Burgundy Wine Club dinner, I decided to put the flight of Comte Armand Clos des Epeneaux (1989, 1991, and 1993) before the de Montille Pommard Rugiens flight (1998, 1999). My thinking was that the younger brawnier more tannic de Montille wines, if served first, would obliterate the Comte Armand wines. Curious to see if anyone has an opinion they'd be willing to share on this. You know this to be true. You can get the best ingredients, prepare ahead of time, have great music on and be in the right mood and still, things don't always work out in the kitchen. 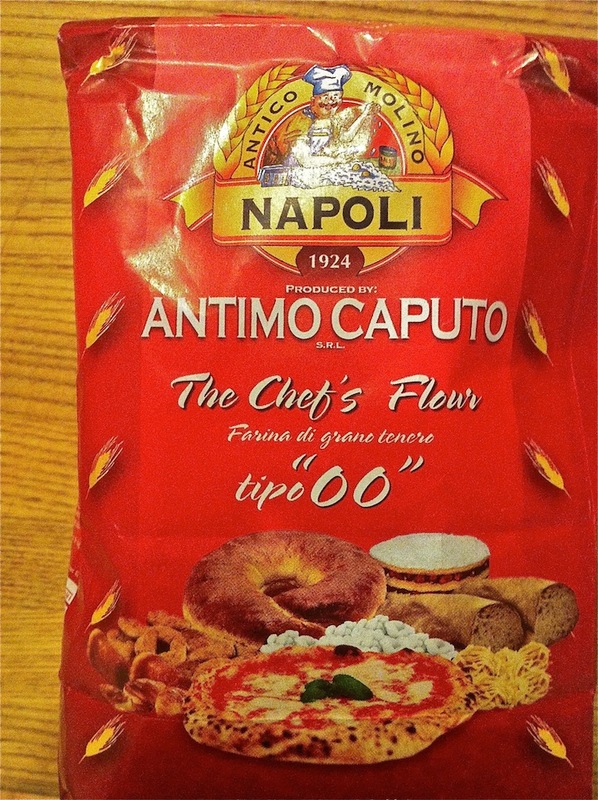 Last week I saw Tipo 00 flour sitting on the "fancy food" shelf in the food coop. 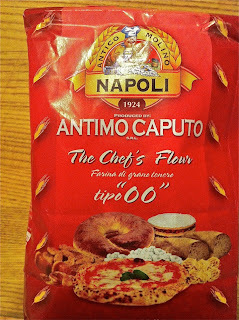 I had only recently learned of Tipo 00 - a very finely ground flour that apparently makes the best pizza dough and pasta. I don;t bake much (read: never), but it seemed like something worth trying. 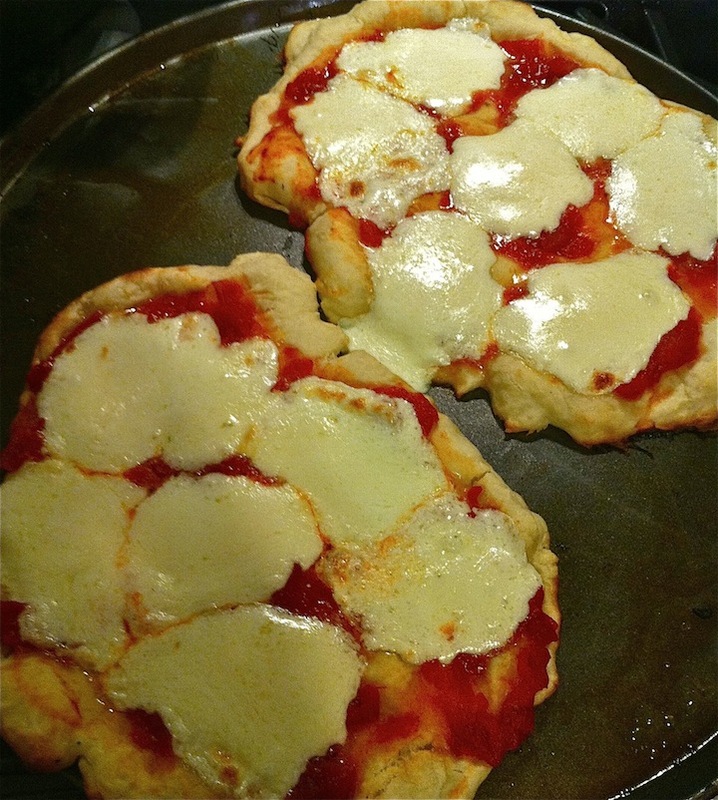 Why not make pizza dough and have fun with the daughters? We could each make our own pizza. How hard could it really be? 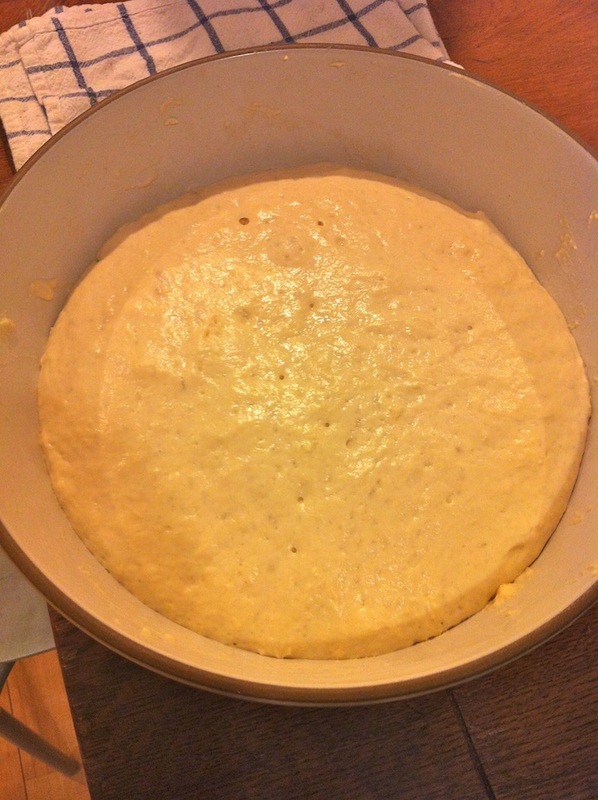 I emailed an Italian friend who is a good cook and has made pizza dough on many occasions. She said to use good yeast, not the kind that comes dry in the packets. 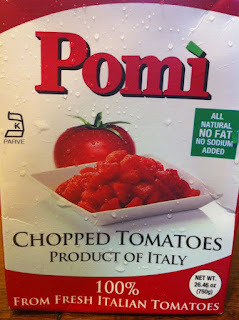 She said that in Italy pizza sauce is not cooked, it is simply pureed uncooked tomatoes. She also said that the oven must be as hot as possible so that the dough cooks quickly, and the mozzarella should be warmed and melted, but not browned. She described the process of making dough as a craft, not a science. "Use 300-500 grams of flour and about half that weight in water, mix in the yeast, some salt, a tablespoon and no less of good olive oil, kneed it and add more flour or water as needed." Loose directions, but I like that - get the feel for it by doing. 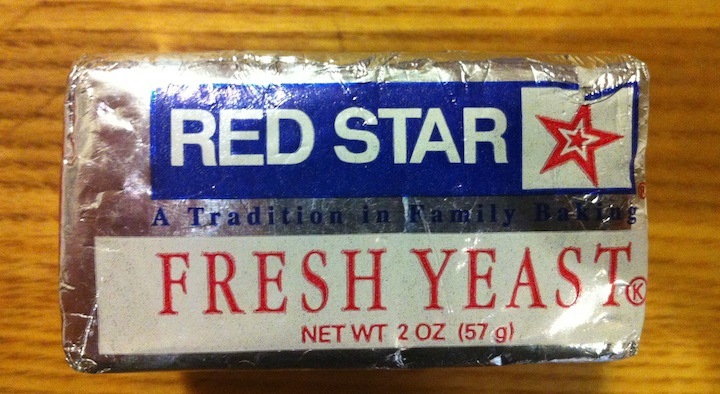 So I bought fresh yeast. and I dissolved half of it in a bowl of warm water. I added about a half teaspoon of sugar to the bowl. Bought a box of tomatoes, planning to puree them, but they came out of the box basically pureed already. That was it for the sauce. I mixed about a cup and a half of flour and the salt, added the yeasty water (after giving it a few minutes to activate), added the olive oil and about 3/4 cup of water, and was thrilled to feel the mixture get doughy in my hands. But it was too sticky, so I added some more flour - maybe another 1/3 cup, and it integrated easily and was no longer very sticky. Covered the bowl with a wet towel and left in on the counter near the stove. Two hours later it had doubled in size. 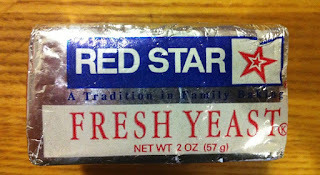 It worked - yeast works! The girls came home, we washed hands and got ready to stretch out some pizza dough. We could have used a rolling pin but I like the idea of working with our hands here. I took the dough out of the bowl and learned lesson number 1: dust the bowl with flour before leaving it to rise. Very sticky. And it was immediately clear that I had not used enough flour. The dough was elastic, but entirely too sticky, too moist, and just not of the right consistency. I was tempted to ditch the plan and make something else quickly, but there were two daughters standing on footstools at the counter who were quite intent on working with this dough and putting sauce and cheese on top. So we worked the dough and lost at least 20% of it because it stuck to our hands. But we shaped those pizzas. 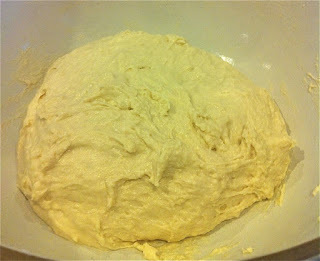 I decided to cook the dough for a minute or two in the 550 degree oven, just to firm it a bit before adding sauce. It was too moist otherwise. This helped, and they spooned some sauce on their pizzas, and then added cubes of cheese. Slices of cheese would melt quickly and then burn quickly in a 550 degree oven. Their pizzas came out okay and they ate them, but the dough was just wrong. It smelled good but it didn't really crisp up, even though I cooked them long enough for the smoke alarm to blare. And the taste was more like a bread roll than pizza dough. It says a lot that the daughters were more excited about the broccoli and peas with sliced radishes and garlic than they were about the pizza. Pizza is one of those very simple foods in which the quality of each element must be right - there is little room for error. The dough just wasn't right, and even a three year old could tell. 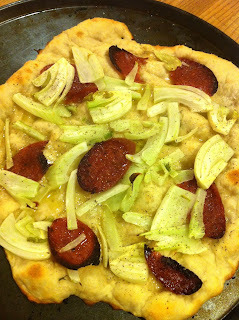 I decided to make a sliced fennel and dry sausage pizza. I rubbed my pre-baked dough with olive oil and a sprinkle of salt, and topped with slices of fennel and dry fennel sausage. This actually tasted very good, although again, it was like eating a fennel and sausage bread roll. I feel good about this, in spite of the bad dough. Next time I will use more flour and I think I have a better idea of what the dough should feel like before leaving it to rise. And if not, if I mess it up again, I'm sure the daughters will be cheerful either way. Not long ago Joe Salamone and Levi Dalton put together a Sherry dinner at the wonderful Prune on the lower east side, and I was lucky enough to attend. Peter Liem was there too, and he indirectly helped to make this happen, as last summer Peter pointed Joe in the right direction when Joe visited Jerez. Joe drank some wines that he loved, some of which were not available in New York. He decided to import them to NYC so the rest of us can buy them. On this night Joe wanted to share some of these finds with a few friends, lucky us. This was a merry situation, we were feeling the love. Good friends, good food, and absolutely world class wines, wines that until recently were unavailable here. Joe and Levi opened the brown wines at least a day in advance and they showed incredibly well, the wines were stunning as a group. Sherry is far more versatile with food than is commonly thought. I think that we in this country are still familiarizing ourselves with dry Sherry, and we tend to think that Fino style wines are for garlicky shrimp and other tapas. Fino wines go well with all sorts of food, actually. 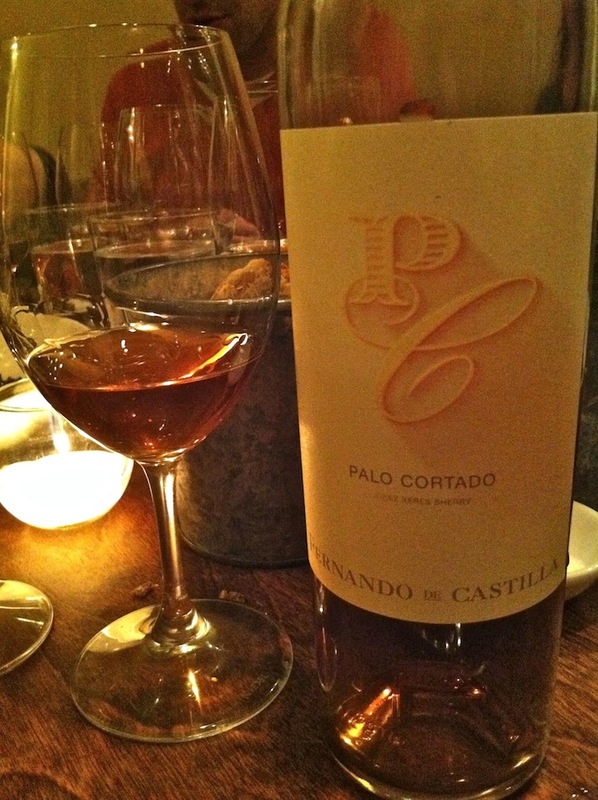 And brown Sherries - Palo Cortado, Amontillado, and Oloroso - I don't think there is a stereotypical pairing idea here because these wines are still so new to most of us. The brown Sherries we drank on this night, these are Sherries that can complement even the richest of meat dishes, as we proved to ourselves at this dinner. We drank Valdespino Amontillado Tio Diego, a great wine that is quite unusual as an Amontillado in that it shows a very pronounced Flor character - buttery like a Fino. 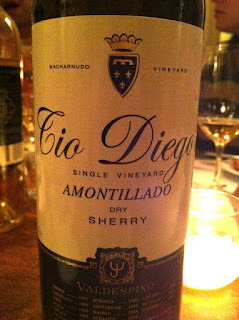 Tio Diego is what happens when Valdespino Fino Inocente becomes an Amontillado and then ages for a bit longer. This is a young and fresh Amontillado, it is refreshing and delicious, not expensive at all, and in Jerez it's everywhere - on grocery store shelves. Frustrating not to be able to buy it here. 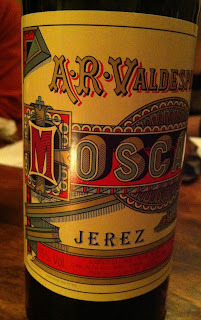 But now in NYC, finally, you might be able to buy this wine at Crush, as Joe is bringing it in. 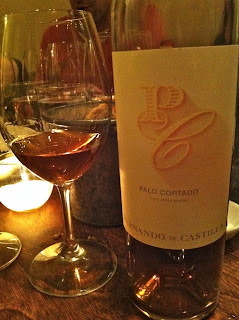 We then drank the Fernando de Castilla Antique Palo Cortado. This is just a beautiful wine. Focus and intensity, grace, detailed aromas and flavors, and a satisfying and complex finish. Pure pleasure, and improves over several days open. This wine goes so well with basically anything on the table. At this dinner, I loved it with shrimp in anchovy butter, and also with thinly sliced roast pork and kale. 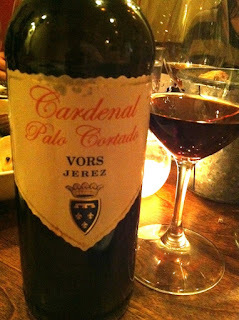 We drank Valdespino Palo Cortado VORS Cardenal, a fine old Sherry that represents the end of the line for Inocente - it contains wines that long ago were part of the Inocente solera before the cellar master selected them out to become Palo Cortado. 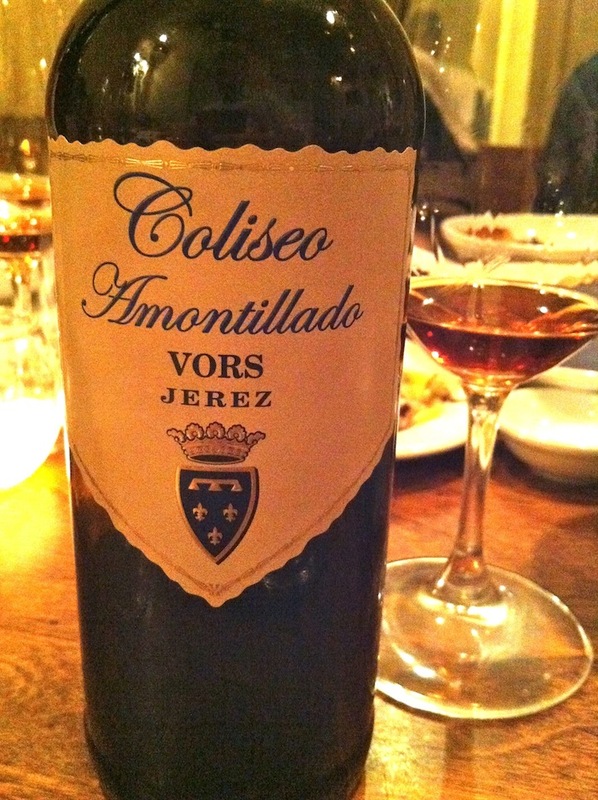 We also drank Valdespino Amontillado VORS Coliseo, an equally rare and fantastic old Sherry that begins its life as a Manzanilla, actually. Imagine going to a dinner where you drink DRC Richebourg and La Tâche. 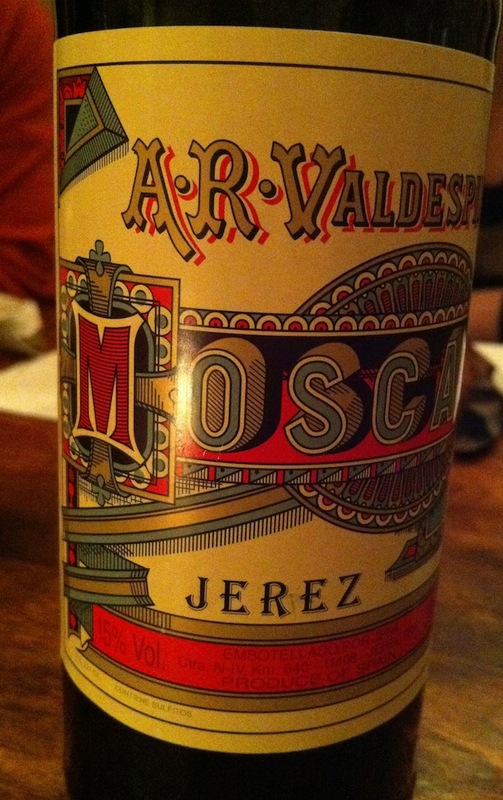 That's what we drank, but in Sherry they're called Cardenal and Coliseo. These are such grand old wines and trying to describe them by naming aromas or flavors is silly. For me, they are show-stoppers, wines that make the table go quiet for a while as people take in what it is that's in the glass. Wines that achieve the pinnacle of complexity and character and deliciousness, things that you should find a way to taste, the way you should read Shakespeare's sonnets at some point in your life. They were brilliant with an amazing dish of braised short ribs and Yorkshire pudding, something that used to be on the menu at Prune a while back. 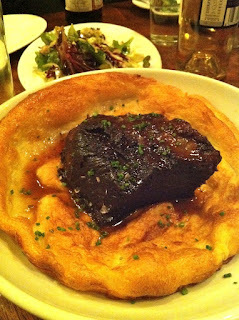 Braised short ribs and Yorkshire pudding...that's a rich plate of food, and I found these two grand old Sherries complemented it perfectly. Honestly, even though these are expensive in an absolute sense, maybe $140 for a 375 ml bottle, Cardenal and Coliseo are worth every penny. They are wines that expand and improve for a week after opening and you only need a small bit at a time, so your pleasure is spread over many evenings. We also drank a vintage Sherry. That's right, a vintage Sherry. 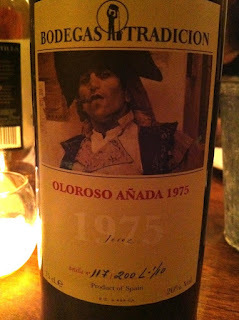 The 1975 Bodegas Tradición Oloroso. Imagine that - the solera system is part of what makes these wines so great, and here is a Sherry wine that never sees a solera. It is vinified and put in barrels, and that's it, as a wine would be in most of the world. I had a few sips of this rare wine at the Bodega in October, but it was at here at this dinner with this food when I understood its charms. This wine had such impeccable balance and harmony, and such clarity and focus. And although its been aged in barrels and exposed to oxygen without Flor to protect it for almost 40 years, it had no rough edges, not at all. Pure class, all silk, just amazing. Keep your eyes open for these wines as they should be available here and there, whereas previously you had to go abroad to buy them. This was a truly amazing dinner and reminded me again that at this point in my drinking experience, I think that great Sherry is as great as wine can be. If I may say, I've become rather adept at the frugal practice of making one whole chicken stretch for many tasty meals. I buy a very high quality chicken - these days I like the White Feather chickens from Bo Bo Farms. My idea is to roast the chicken, but jut the thighs, legs, and breast. The back, neck, feet (yes, you get the feet when you buy a Bo Bo chicken), and other parts go into the stock pot. I could roast the whole bird and then put everything but thighs, legs, and breast into the stock pot, but these days I prefer the taste of stock made from un-roasted bones and meat. So I emerge with meal number 1 - roast chicken dinner. 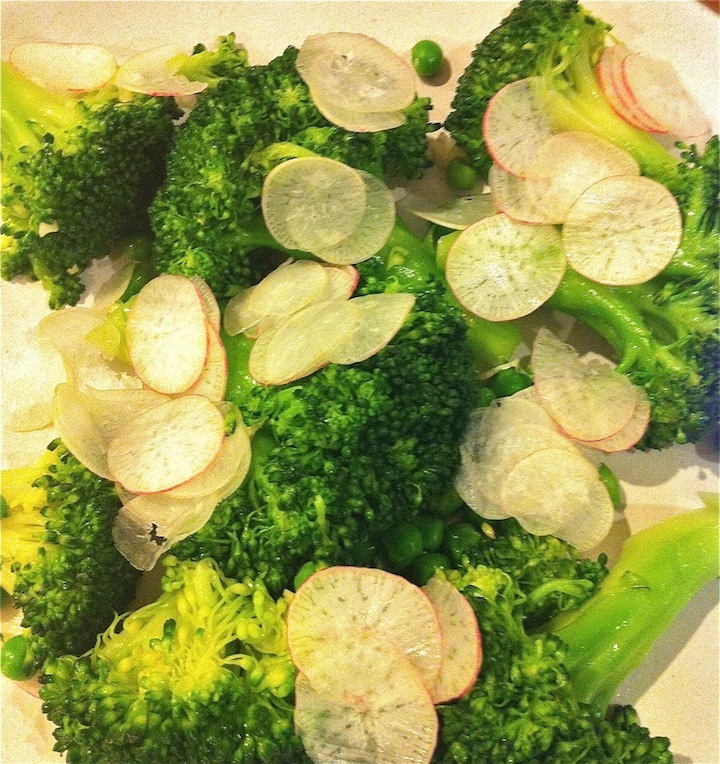 Last week my daughters and I ate this with fregola pasta with broccoli and turnips. But two small children and I will not finish two legs, two thighs and a whole breast. I tend to serve the dark meat at roast dinner, and save the breast for things when chicken isn't the star of the show, when it's just the protein delivery system. Meal number 2 - daughter's lunch of shredded chicken breast, Chinese cabbage, and red pepper roll-ups. A drop of sesame oil and soy, and they gobble these up. The chicken is protein, the flavor and aroma comes from whatever else you add to the sandwich. The point of this post is meal number 3 - soup. I make a simple stock using techniques from various conversations and cook books. I start with the aforementioned uncooked chicken parts, a whole onion in quarters, a carrot or two cut in half length-wise, a celery stick cut in thirds, and then, depending on what's in the kitchen, add things like a sliced knob of ginger, a bay leaf, a bunch of parsley or other herbs, a Parmesan rind, whole black peppercorns, and so on. Bring gently to a boil (Alice Waters, I think, said that stock should be made gently at all stages) and then simmer very gently for at least two hours, skimming the top at least once. 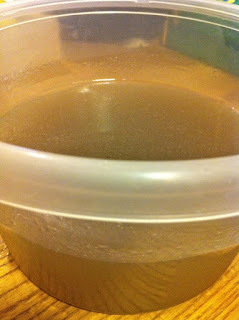 I add salt after straining it and tasting, and not too much - anything I cook with the stock will also get salt. Warm your stock in a separate pot while you cook 1 chopped medium onion in a small bit of oil over medium/low heat for a few minutes until the onion softens. Add chopped carrots and celery and cook some more, adding a little salt. Try to cook these aromatic vegetables as long as you can without burning them - they are the base of flavor and aroma for the soup. Add the chopped bok choy stems and greens and stir frequently. Add the washed lentils - I used only about a half cup for the whole pot here, because I wanted a soup that had lentils in it, not lentil soup. 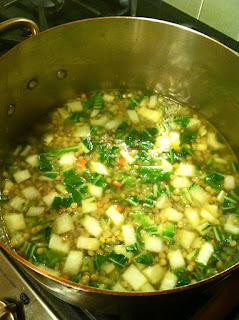 Stir some more, coat the lentils in the vegetables and their juices, add a little more salt. Now add the warm stock and bring to a boil for about 1 minute and then reduce the heat to a simmer, cover the pot almost all of the way and let this simmer for 20 minutes, and then start checking to see if the lentils are done. Meanwhile, take what remains of the chicken breast and shred it so that it will be nice in the soup, small shreds are easiest to eat. 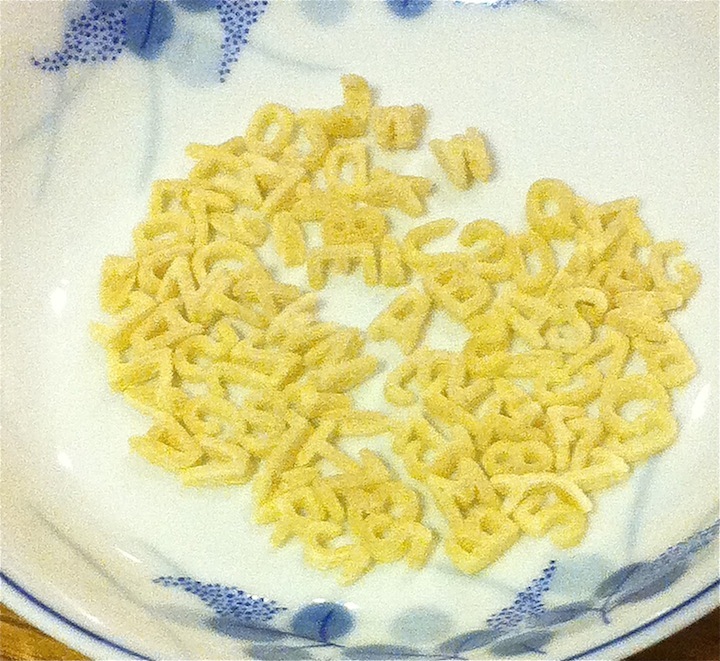 The alphabet pasta are tricky. Cooking them in water separately, for me, always results in soggy pasta (I need a brand for alphabet pasta that's better than Ronzoni, but have not yet found anther brand). I've started adding the dry pasta directly to the simmering soup about 8-10 minutes before I want to serve it. So this is the finished soup, and let me tell you, it feels good to watch them devour something like this. I'm eating the soup too, mind you, and daddy wants a glass of wine with dinner. 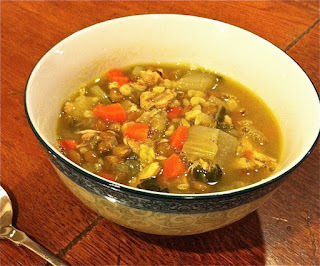 So please, you be the sommelier - what would you serve with chicken soup with bok choy, lentils, and alphabet pasta? 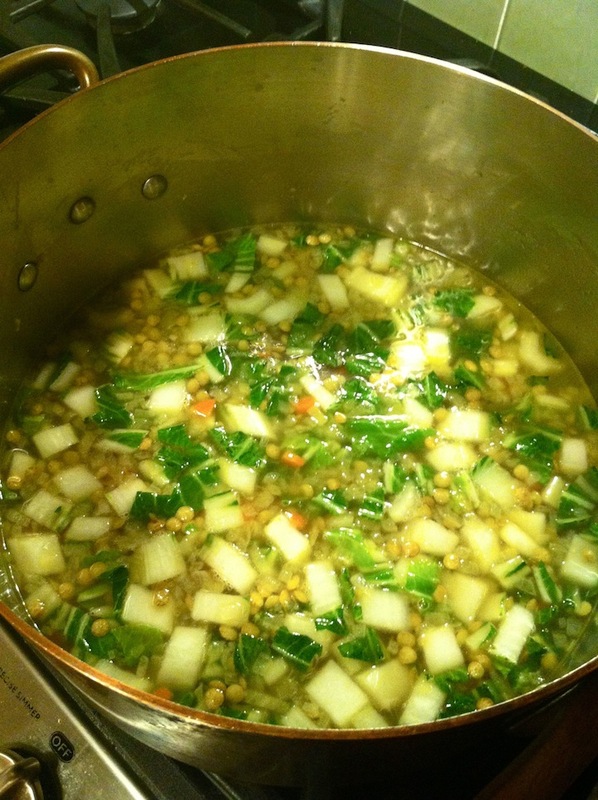 And by the way...if I can get away with not using all of the stock for the soup, I have meal 4, which lately has been turnips and their greens braised in stock - delicious! And meal 5 is leftover soup. Dare I strive for a meal number 6? Time will tell. Marius Gentaz Côte-Rôtie - a Dinner for the Ages. The other night I did something that I have never done before, and most likely will never do again. I drank a Marius Gentaz Côte-Rôtie. Gentaz is the revered traditionalist farmer and wine maker whose Côte-Rôties are considered by many Rhône cognoscenti as the greatest of all the Northern Rhône wines, the greatest Syrah in existence. 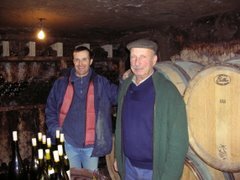 Gentaz never made large quantities of wine, and he stopped making wine after the 1993 vintage - he retired and his nephew René Rostaing took over the vines. From what I hear, Rostaing immediately ripped them up and started over, which is a tragedy of epic proportions. 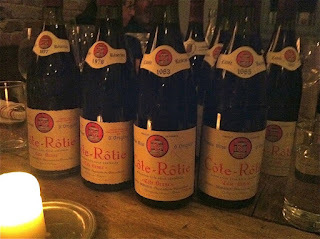 There simply isn't a lot of Gentaz Côte-Rôtie out there, and whoever has the wine is jealously guarding it. I've never seen a bottle on any of the auction sites or on restaurant lists - I've never seen a bottle, period. And for the past few years, I've been keeping my eyes open. Honestly, fugedaboudit, it's not going to happen. The wines have skyrocketed in price and become more rare every year as people drink what they have. I remember a few years ago a friend told me that he was going to have dinner at some place in Manhattan where Gentaz was on the list at the bargain price of $800. Sounds like a lot, right? What would a bottle of 1993 DRC Echezeaux cost at a restaurant? That is a bottle that you will never have a problem finding, if you want it - there is nothing rare about DRC. But Gentaz Côte-Rôtie, an incredibly rare and superlative wine? Maybe $800 is not such a terrible price. Get 8 people together and you each get a glass each for 100, a glass of something that will never again exist on the planet, something truly glorious. I've wanted to drink Gentaz for years, ever since hearing my friend Peter talk about the wine in hushed and awed terms that he uses only for only a few wines. Well, the other night I was incredibly privileged to drink Gentaz. Ten bottles actually - an embarrassment of riches. 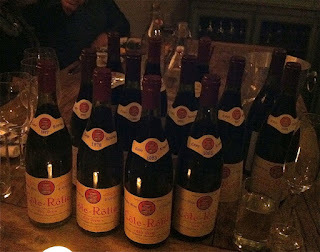 This is what happens when a few generous collectors decide to hold a Gentaz tasting and dinner. Why did I get to go to this dinner, you might be wondering. Because I discarded any sense of decorum and I begged, pleaded, and begged some more, that's why. Wow, what a night. The wines and the food were absolutely amazing, and that's an understatement. We drank 10 vintages of Gentaz, but we were many people and we drank the wines slowly over several courses of food. I took notes but they don't come close to the experience of drinking the wines. I'll try to share some notes and experiences, but maybe before you read on, take a look at this lovely article by Eric Asimov from this week's Dining section - he writes about Gentaz and offers more context for the wines. The first wine we drank was the last Gentaz vintage, the 1993. May I tell you that I was rather excited as the wine was poured into my glass? My first sniff of a Gentaz wine, and it was thrilling. It reminded me of a wonderful wine I drank a little over a year ago at a ridiculous lunch at Neal Rosenthal's house, the 1985 Ferraton Hermitage. The '93 Gentaz was pale in the glass, but it offered such intense and crystal clear aromas, it was such a vivid and electric wine. My notes say "black peppercorns, very spicy, rose petals, iodine, broth, flowers, so complex and lovely." All of that is true, and more. The wine was the epitome of grace and detail on the palate and its incredible harmoniousness made it seem less potent at times than it actually is. I loved this wine, as much as I loved any of the wines we drank. Some of that has to be because it was my first, but I also think it was legitimately a great wine. The 1992 was corked, alas. The 1990 was not. It was more dense, with musky notes mingling with the flowers, pungent and gorgeous. The wine was very different from the 1993 in character, but they shared the same incredible grace and harmony, something that apparently is the hallmark of Gentaz. The wines are seamless, so much so that it can be shocking. The 1977 I thought was absurd in its harmony and grace, its perfect mingling of spices and rocks and flowers, and hints of bloody meat. My notes say "there is no way to improve this wine." The 1987 was delicious and very drinkable, but not as memorable to me as many of the other wines. The 1989 seems like it will be as memorable as many, but it was still hard and tannic on this night, a wine that probably needs another 10 years of relaxation. And then there was the 1988. Utterly gorgeous. Wide open, seamless, complex, as delicious as anything I can remember drinking. I felt like a 15 year old at the high school dance with this wine in my glass, hard to know what to do with myself, awkward, in love but not understanding the object of my desire, mystified and elated, covered with pimples and just a total mess. And after that the 1985! Just as good! Spicier, more meaty and of the bacon, and still perfectly harmonious. How did this guy do it? These wines are perfect. Some people loved the 1983, others thought there was something off, not TCA, but some sort of cork taint. I appreciated the wine but definitely sensed the taint. 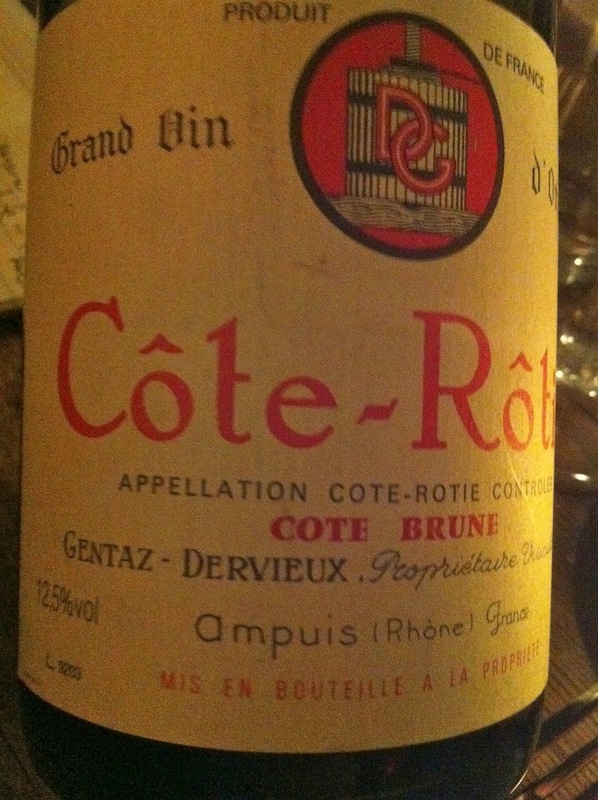 That's okay, because then we drank the 1978, the most exalted of Gentaz vintages, from what I am told. 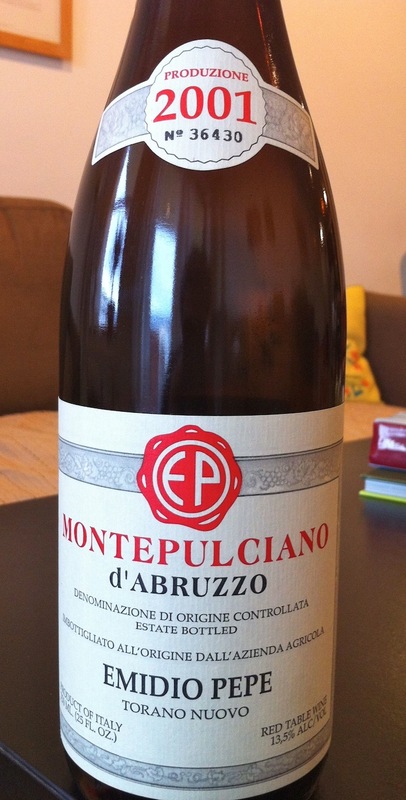 The wine was mature and perfect, gamy and pungent, finely grained, meaty, fresh as a daisy, just ridiculous. Wine for a time capsule. Then we did an interesting thing. 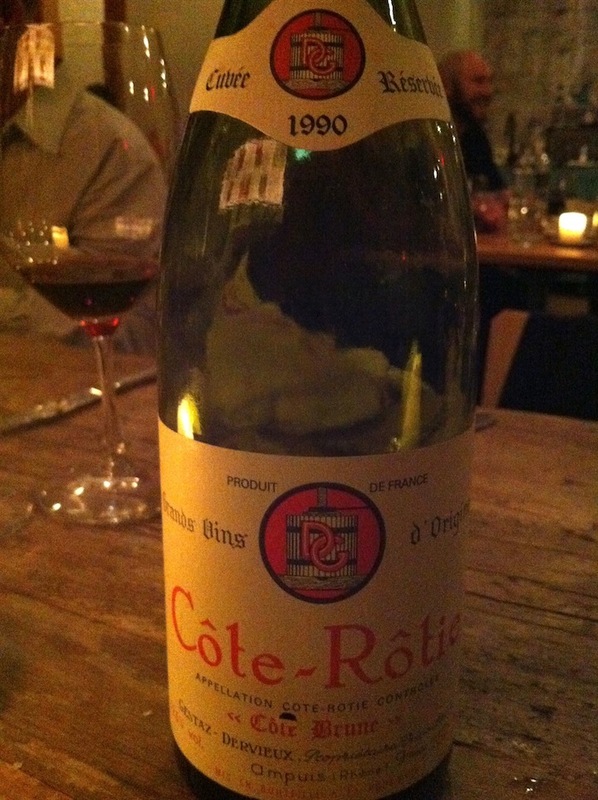 We drank the 1991 Gentaz Côte-Rôtie with two other 1991's, also made by great producers, you know, just to compare. The 1991 Noel Verset Cornas was not showing so well, there was volatile acidity. The 1991 Chave Hermitage, though, was truly excellent, and taught me something very important. 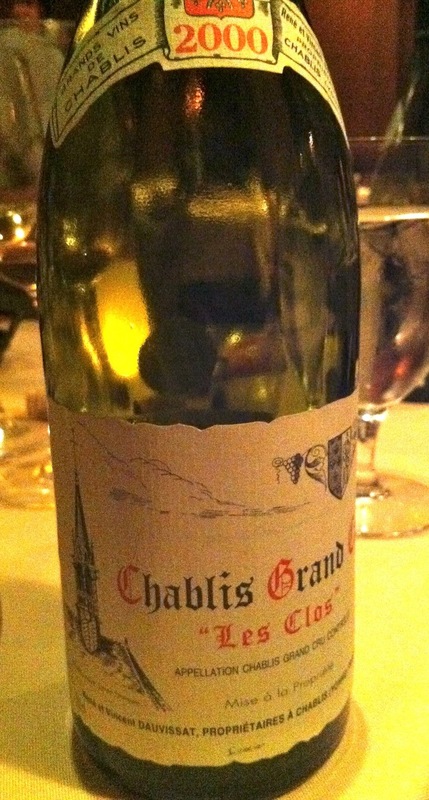 The Chave had such an effortless power and it was so very refined on the nose. I cannot say that it was better than the Gentaz wines, but it was most certainly playing at that level. It was different, in the end. More of some things, like power and richness, and firmness of structure. I remember thinking about how the Chave wine seemed to effortlessly do what the Gentaz wines had to struggle to do, if that makes any sense. There is plenty of beauty in the struggle, it's just a different kind of beauty, one that it a bit more raw. Peter said it was the grandiosity of the Hermitage terroir shining through. That, to me, is something to ponder. This was an incredible experience, once that would be near impossible to repeat. I am so grateful to have had the chance to experience these wines, this bit of history. Slope Farms sells pork now. I cannot tell you how excited I am about this. Ken and Linda Jaffe (former Brooklynites who moved to the Catskills) are dedicated to farming healthy cows, and theirs is my absolute favorite beef. I'm not sure of the details on this new pork venture, but I hear they have an elder and respected neighbor who advised them as they set up their farm. This neighbor raises pigs. 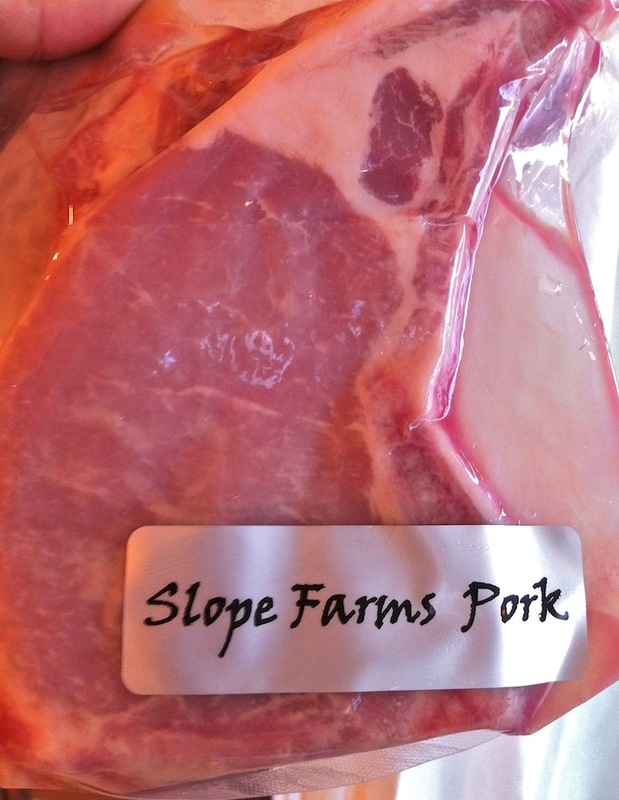 The Jaffes now sell their neighbor's pork. Look at the marbling on the meat, and the beautiful color. I've tried the chops and a rib roast so far, and WHOA, this is very very good pork. 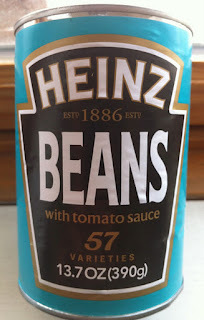 And on the other end of the food spectrum, processed food, I've discovered what I now believe to be one of the finest canned food products - Heinz baked beans, the kind they sell in England. These are done in tomato sauce, not in that cloying brown sugary sauce that our baked beans swim in. If you see these, try them. Okay, they're canned, but they're actually not that bad for you. And they taste so very good. 2001 was not a very good vintage in Champagne. Not many vintage wines from that year - it was rainy, especially in the weeks leading up to harvest, there was a lot of rot, and it was a challenge for the grapes to ripen. 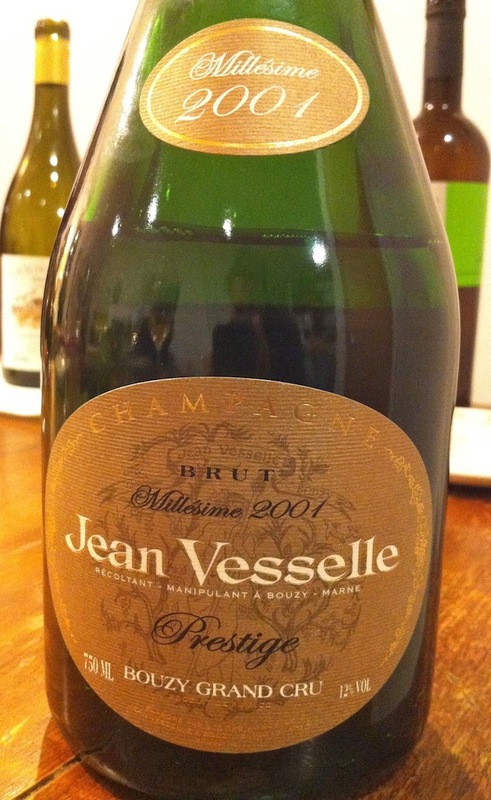 I know from reading ChampagneGuide.net that this is considered to be one of the most challenging vintages of the past 20 years. 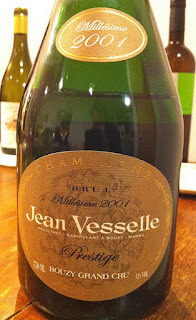 So it was fascinating to have the opportunity to try a vintage wine from 2001, Jean Vesselle's Brut Prestige. This wine is all Bouzy, a blend of 70% Pinot Noir and 30% Chardonnay, but it reminded me of a wine I tasted a few years ago by Moutard that is made with the obscure grapes of Champagne, things like Arbanne and Petit Meslier. The wine had overt notes of green herbs and leafy vegetables, and I think it would have benefited from a few grams more of dosage (it was dosed at 3 grams, I believe). But really, it was good wine, well balanced and particularly lovely on the nose. 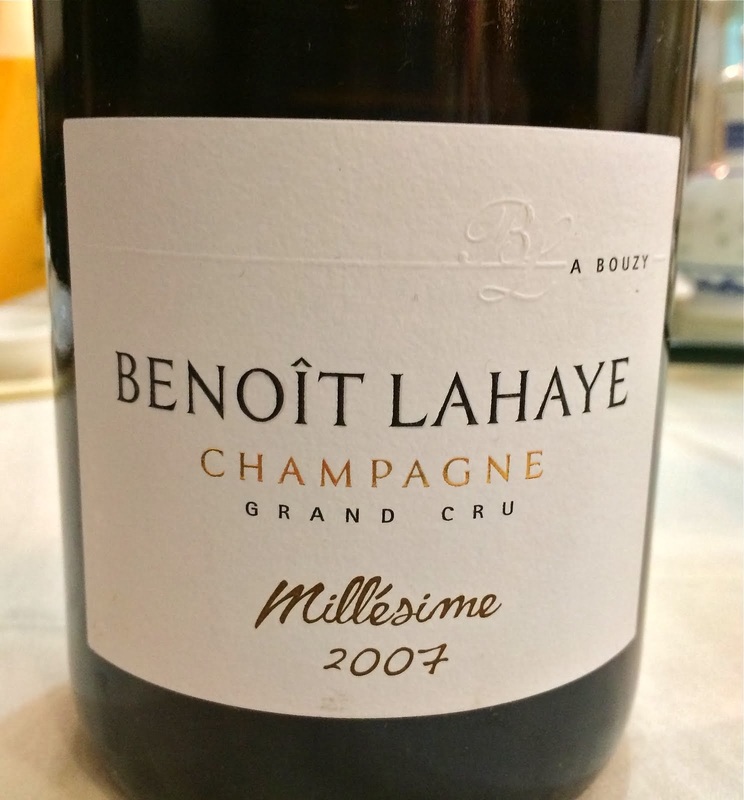 I cannot say that it is what I dream of when I want Champagne, but it was a very good wine, and a reminder that it is possible to enjoy well-made wine from bad vintages. I had dinner with a few friends and we each brought wine to the restaurant. These were good wines, on paper anyway. We arrived at 7:00, opened everything, and it was clear that nothing was showing very well. After a little while, I don't know how long exactly, but probably an hour or so, all of the sudden everything was fantastic. I'm talking about a bottle of 2000 Vincent Dauvissat Chablis Les Clos that was butterscotch pudding for a while, and then turned into this detailed and focused thing of beauty. Some caramel notes, but also a bunch of freshly picked white honeysuckle. Pungent, long, and intense with a saline edge to the finish, this was a beautiful wine, a very special treat. 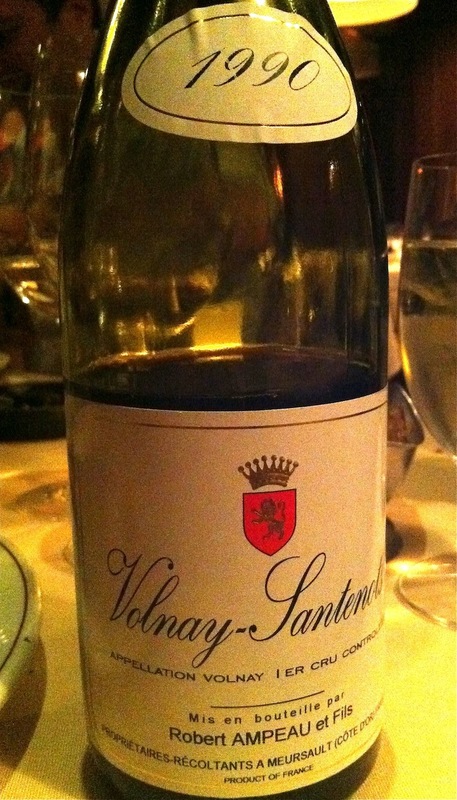 And the 1990 Robert Ampeau Volnay Santenots, a wine that began better than the others, but still was a tangled mess. And an hour later it was gorgeous - a complex and beguiling nose that had that vibrant mature-wine-pungency thing. Flowers, musky and gamy, but in the end, very much about stone. And it is the texture that gets you - the wine couldn't be more silky, and this silk surrounds what essentially is a wine about rock. Textbook Volnay, and a truly compelling and lovely wine. 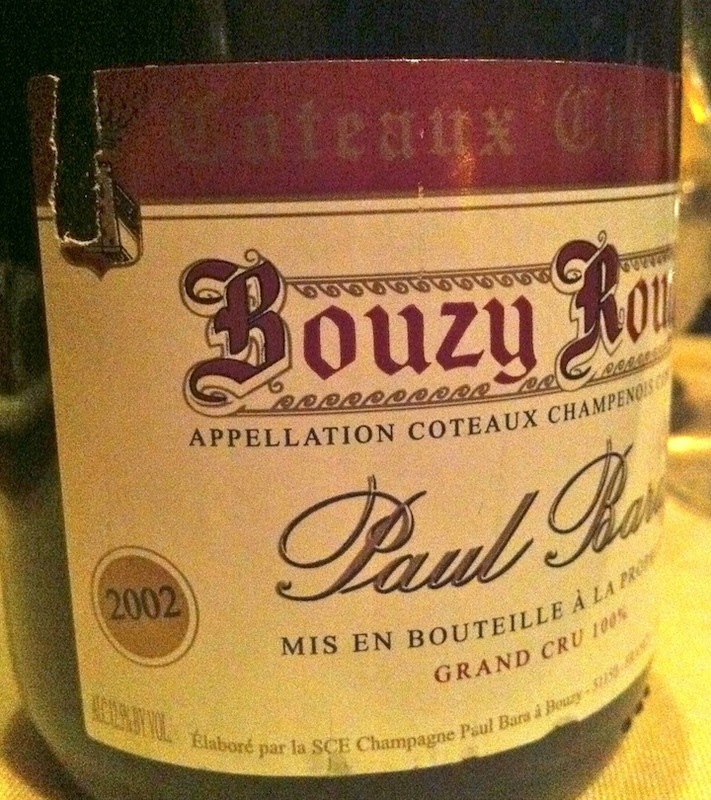 And the 2002 Paul Bara Bouzy Rouge Coteaux Champenois, a wine that was probably the messiest of all when we first opened it, all bramble and pitch black fruit and very disjointed. But later on, I swear this wine was the freshest and most detailed wet stone basket of ripe strawberries, so pure and elegant, light as a feather. And the 1999 Eric Texier Côte-Rôtie, a wine that fooled all of us. 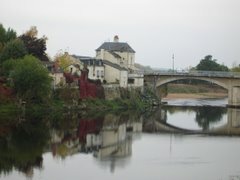 It was a red fruit mash at first - I would have guessed a Grenache heavy wine from further south had I tasted it blind. This one took the longest to come around, but when it did it was a classic old school bloody, meaty, black olivey, and very mineral northern Rhône Syrah. Can I tell you that the next day I learned that our dinner occurred on a flower day...but only after 8:00 PM. Why do these annoying coincidences keep happening with the confounded biodynamic calendar and the way wines taste? 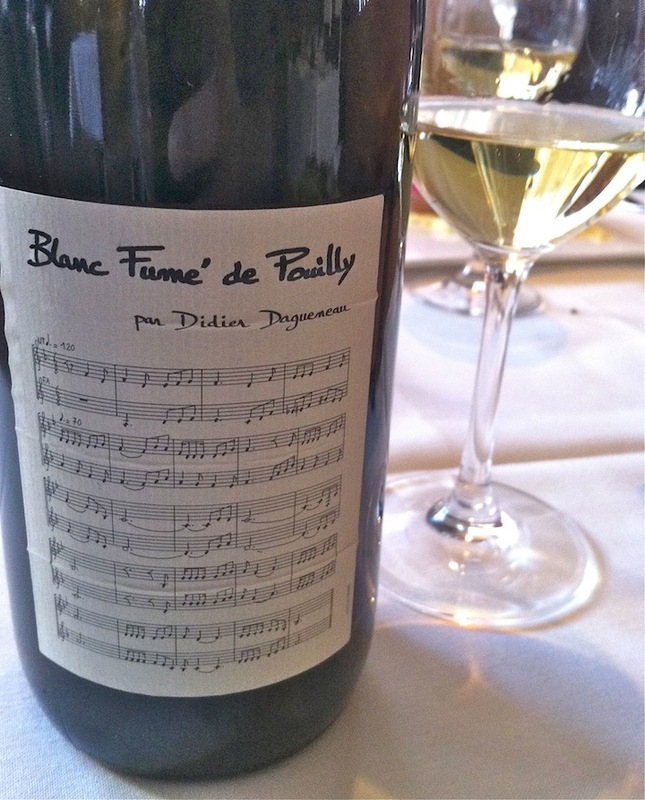 At a restaurant in Boston I drank a bottle of 2007 Didier Dagueneau Blanc Fumé de Pouilly. The wine was beautiful, a perfect mingling of freshness, tension, elegance, and quiet intensity. It was not in any way showy, and was amazing in its perfect harmony, not for any one particular characteristic of aroma or flavor. Wow, I wish I had more experience with Dagueneau's wines. They are awfully expensive now. I recently drank an Emidio Pepe wine for the first time, the 2001 Montepulciano d'Abruzzo. It had been open for hours before we drank it with dinner. I loved it, really loved it. Such interesting and delicious wine. Jet black fruit, very brawny, but detailed and fresh, with cooling herbal aromas, and a streak of something like tar and leather. It was lovely with the aforementioned Slope Farms pork roast, and I must find a way to drink this iconic (and expensive, and apparently very variable) wine again. 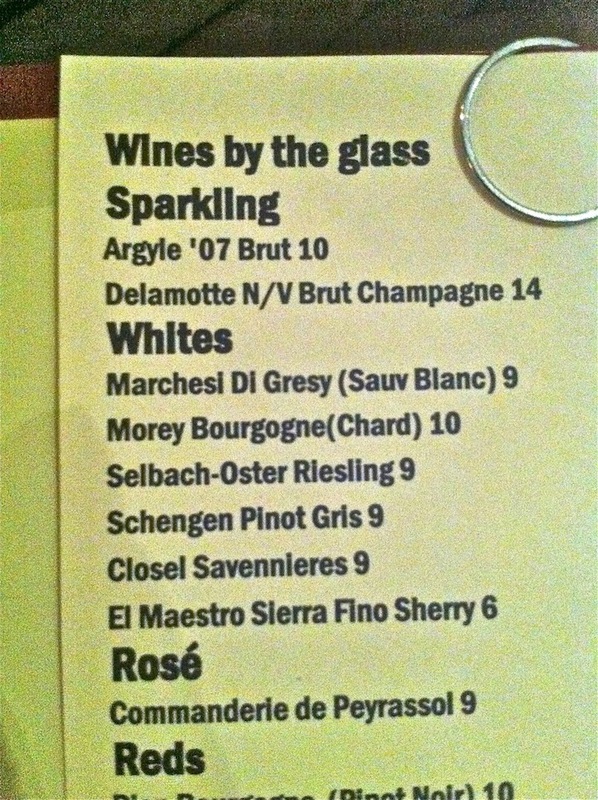 Lastly, look at this nice list of white wines by the glass. This is at the restaurant Herbsainte in New Orleans. I was down there recently for work, and stopped in to have a cocktail before retiring to my hotel room. 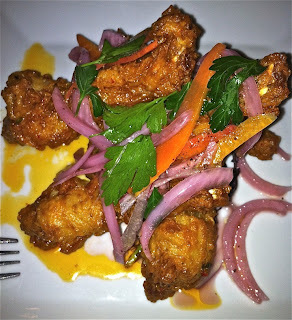 But before I could order, I overheard the bartender telling another man that there was a buttermilk fried Louisiana frog legs special that evening. Hmmm. 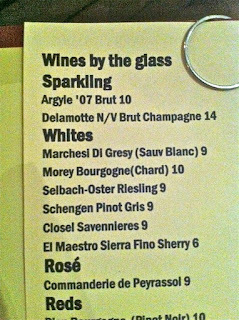 Forget the cocktail - I ordered a glass of El Maetsro Sierra Fino (!) and the frog legs. Well that whole situation was so delicious, that I decided to keep going, and drank a glass of the 2010 Domaine du Closel Savennières La Jalousie with a little plate of Gulf shrimp and grits with okra. Even more delicious! You know, I used to love Closel but I kind of gave up on the wines after not liking anything after 2002 (and after the last of my 2002's showed oxidized). I told friends that I was done with the wines. Well, I have no idea what's really going on with Closel, but honestly, this 2010 was just excellent - fresh, pure, balanced, showing typical wooly and waxy notes and lots of minerality. A reminder to me not to make pronouncements about wine. I just don't have the years of drinking experience to make pronouncements.